State of Origin Game 2 is shaping up to be an absolute belter. Likewise, we’ve called up one of our big guns, Tim Gore, to jump on the Roar LIVE panel as we preview this crucial second game. 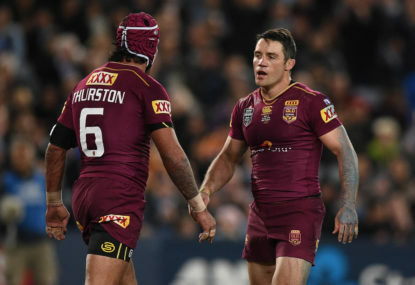 We’ll be talking Queensland’s selection shake-up, tactics and predictions as well as having a crack at guessing what the Thursday morning headlines will be. If you’ve got a penchant for puns, or just back yourself enough to guess how the game will play out, give us your guess for Game 2 headlines. Will Mitchell Pearce break his Origin curse? Will Billy Slater rip the Blues to shreds? Will another protracted, bizarre decision from the Bunker turn the game on its head? Let us know in the comments and we’ll get to as many as we can on the show.